We have covered a few apps we have played with on the iPad which add a High Dynamic Range effect to a photo through filters. These can quick add some pop to a photo, particularly those involving light/dark contrasting areas like clouds in the morning sky. The actual creation of HDR photos is done by merging a dark and light version of photo of the same scene together into a single image. This requires software on your desktop to match up the photos then fine tune which areas of each of the two photos are kept in the final image. 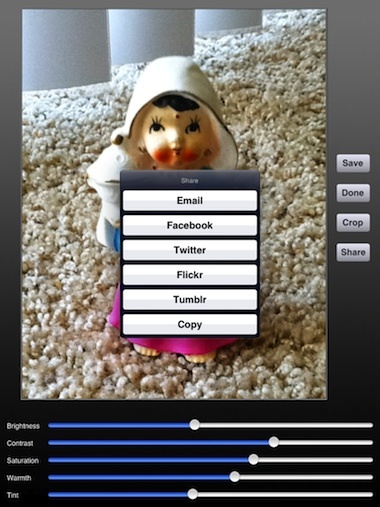 An app on the iPhone, now for the iPad, that does the multi photo taking and merge into a single image is Pro HDR. Multiple photos, merged into the single HDR image, all automatic all on the iPad. Launching Pro HDR, you can choose which camera to use, if you want a background grid for alignments, hiding all of the on-screen options, and if you want the app to take the two pictures automatically. 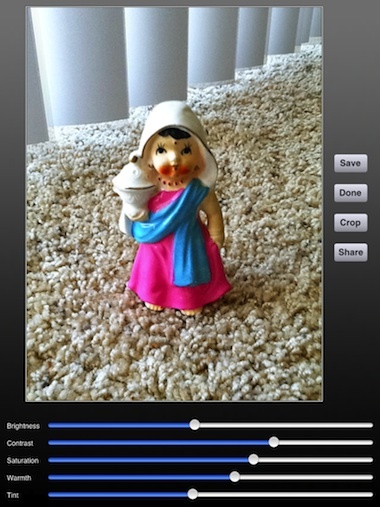 When you tap the screen, Pro HDR examines the dark and bright areas, then automatically takes an image at those two levels. It takes a couple seconds to take the two images and merge them together. We have found the Pro HDR app is much faster on the iPad2 than on the iPhone4. 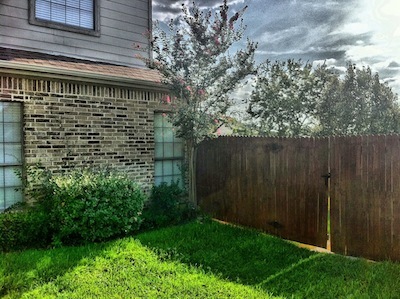 After Pro HDR is finished taking the two images, it automatically merges the two together and presents a single final image. There are sliders to fine tune the image over all. 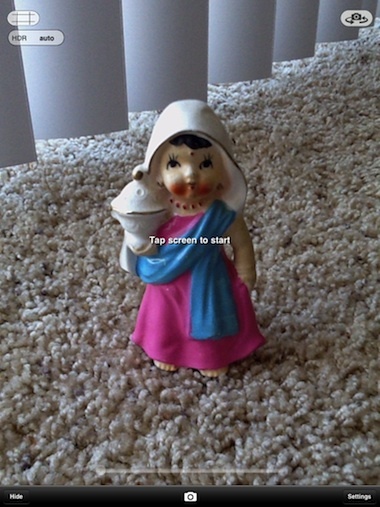 Also, from the final image screen you can crop your HDR photo and finally save it to your iPad’s photo library. Sharing images can be done directly from Pro HDR to your friends and fans on Facebook, Twitter and Flickr. You can also post to your Tumblr site, copy to paste into another app or attach to an email. 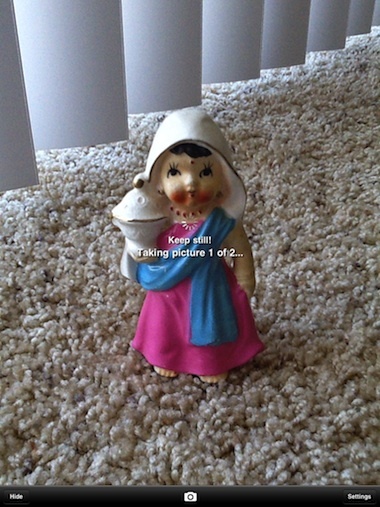 Since Pro HDR takes multiple pictures for each resulting single image, the Settings allows to save each of the photos or just the resulting image. 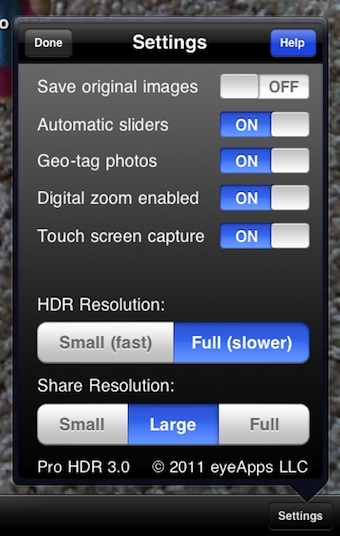 As well, resolution, tagging and on screen controls are all able to be turned on/off.